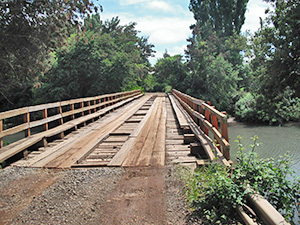 During November 2012 Kim Bannister and Duncan Milligan are exploring South America to find the best roads and make the route notes for next year's Vintage Cape Horn. Whenever possible they are sending back reports that provide a flavour of what lies ahead for those who join us next November. The weather in Buenos Aires is bright, hot and sunny - and will be the same when we arrive next November with the cars for the start of Vintage Cape Horn 2013. Our chosen five-star hotel is only minutes from the port, so we can collect our cars and return to the comfort of the covered parking area for any last minute preparation before the safety checks, scrutineering and other pre-start formalities. 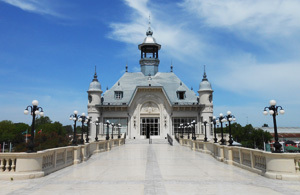 We have also checked out the wonderful start venue at the Art Museum at Tigre in the north of the city. They are very keen to welcome the cars and display them for all to see. Argentina is a car mad country so we can expect some keen spectators to cheer us on our way. After the start from Tigre we have a gentle run along the highway to the city of Rosario for our overnight halt. This will get the event away from the Buenos Aires area, home to almost a quarter of Argentina’s population and therefore a very busy place, and on our way west towards the Andes and some of the most stunning scenery you could hope to experience through the windscreen of a vintage car. It’s an easy day, so will also help both the car and crew settle in to the event. At Rosario we have found a newly renovated race circuit and we are currently in discussions with the owners to see if we can arrange a few hours use for a little fun and competition. Our hotel in Rosario is close to the highway so it’s an easy get away to either the circuit or the road to Cordoba and the drive west towards the Andes. From Rosario, another easy-going day as we will use Route 9, the Pan-American Highway, before turning off just south of Cordoba towards Alta Gracia and, if negotiations are successful, another race circuit just south of Cordoba city, at the end the day. Our hotel for the night is just outside the city centre so there will be time to explore before dinner. Leaving Cordoba, the route is soon into the hills for the first time, these are not the Andes but a good introduction to what lies in store later in the event. We have found two lovely, twisty, smooth tarmac sections before a coffee stop at the Parador Condor, which at a height of 2,150 metres will give crews a great chance to see the majestic birds that the restaurant is named after, soaring in the crystal clear skies overhead. After coffee the road drops down through some truly wonderful scenery to the town of Mina Clavero, birthplace of Argentinean rally legend Jorge Recalde. We also took the chance to explore a lot of gravel roads in the area but these were far too rough to use on this type of event so have made sure we stay on tarmac today. After leaving Mina Clavero the road flattens out and the rest of the day will be spent on smooth, fast and almost traffic free roads, all the truck traffic heads south to join a motorway towards the Chilean border, to our overnight halt in Mendoza. Mendoza seems so much more relaxed than Cordoba. Leaving Mendoza there is only one choice of road to cross the border into Chile. Route 7 is a lovely smooth tarmac road which climbs its way steadily to over 3000 metres before reaching the border post at Los Libertadores. Our route to the border also passes Mount Aconcagua, the highest on the continent, on your right. We are lucky today, the weather is hot and sunny with clear blue skies so the mountains look wonderful. At the border crossing point the usual formalities were dealt with quite quickly, just remember to bring a pen with you to fill in the various forms required. The Argentina Out and Chile In windows are next to each other. The Chilean customs people were very thorough and searched all our baggage; they are particularly concerned with the import of food stuffs and plants. Once across the border the road descends through an amazing series of hairpin bends with great views dropping very quickly from the 3225 metres at the border point to below 2000 metres into the town of Los Andes where we join the highway south to Santiago. On our way south we have found a lovely section of 19kms in the hills, a new tunnel on the highway goes under the pass that we crossed. The road is currently gravel for about 9kms but we spoke to a road work crew who assured us the road will be fully paved by the time we arrive next year. Any crew who chooses to avoid the section can just continue on the highway. Our hotel for the next two nights will be the Hyatt Grand and it lived up to expectations, great food, good wine and excellent service. On the rally crews will have another rest day to enjoy the city and various other trips on offer but our route survey work continues so we push on south. We left Santiago and headed south on Route 5. Leaving Santiago proved to be very easy, if a little slow at times. Once on Route 5 we tried various options in the back roads either side if the highway to break the journey up and have found a lovely lunch location in Santa Cruz. The hotel is owned by a car enthusiast who also has his own vineyard and museum which we are trying to arrange a visit. After lunch a lovely run through the quiet Chilean back roads takes us back to Route 5 to continue south before we once again turned off to explore some of the gravel roads in the area. Two optional sections were found, the first on a beautiful track through a forest area the second a little stonier but still good and taking us back to the highway. A further short section on Route 5 took us to San Carlos where we again headed east to find a way through the countryside avoiding the long trip down and through the city of Chillan on our way to the hotel in the ski resort of Termes de Chillan. After inspecting a number of possible routes we found what we considered to be the best, although there were a few rough patches, but the distance and time over the journey through Chillan was worth it. Any crew who wants to stay completely on tarmac wherever possible will be given the route through the city. Our hotel for the night will be the Gran Hotel at Termes de Chillan and our inspection found a lovely swimming pool, spa, and hot baths area together with a well stocked bar and traditional restaurant, all this with fantastic views of the mountains, a really lovely location. 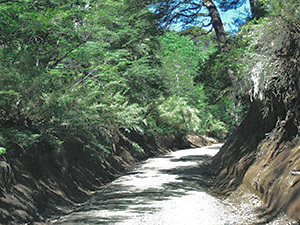 We left Termes de Chillan and began to explore the minor roads to the west of the resort as I wanted to find a way through the countryside without driving the 82 kms back to the city of Chillan and then heading south on Route 5, the only other real option. We tried a number of roads again before finding a short cut which uses some bumpy gravel but taken at a low speed will not be a problem and will save a lot of time on the day. Heading south on the N59 we found a gravel loop to use as an optional Medal Section, those crews wanting to avoid this can simply continue along the tarmac main road, before having to re-join Route 5 as this is the only road which would take us south to where we needed to be. At the town of Victoria we headed east to explore the area and found what must be one of the most wonderful roads I have ever driven. The road through the Parque Nacional Conguitto takes you around Volcano Llaima, which last erupted in 2008, through a lava field and a forest of the tallest Monkey Puzzle trees I have ever seen. The views are amazing but the road is only for those who want an adventure. It is unsurfaced with constant changes between stony, sandy and occasionally muddy surfaces with twists and turns and ups and downs. 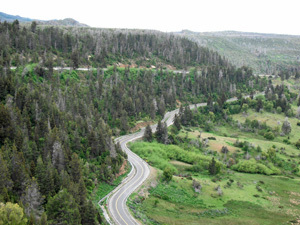 Once out of the forest area and into the southern lava field the road opens out and the surface changes again into a beautifully graded gravel track with sweeping bends before joining tarmac. Today we are looking for an optional route for those who do not want to take their cars through the park but also do not want to take the only all tarmac option on Route 5. After an early breakfast we headed east through the town of Vilcun and into Cherquenco to try and find a track shown on two versions of the maps I had but not on the other. The two versions were correct and we found ourselves on a newly graded gravel road to the west of Volcano Llaima which joined our original route near the town of Cunco giving us the third option to consider. From Cunco we then used a bit of guesswork to find the correct road out of town to the south to find a way through towards Villarrica and our hotel for the night. 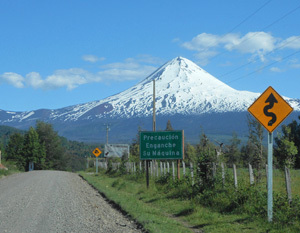 The roads were clearly signposted and recently graded, which made them a little stony and corrugated uphill but generally good and it was a lovely drive passing Lake Colico, with views of Volcano Villarrica in the distance. The tarmac roads returned before we reached the town of Villarrica and then on towards the hotel the event will be using for the overnight stay. The Villarrica Park Lake Hotel is a five-star luxury hotel on the banks of Lake Villarrica with stunning views from the rooms, bars and restaurant. Tomorrow we head back into Argentina. Spending a little more time in each area and exploring the back roads really worked today as we found a superb 16kms gravel loop to start the day before joining the main road and the run to the border. The road is tarmac for most of the way then becomes gravel which is bumpy in places before reaching the Chilean border post. The border officials were friendly and very efficient; just make sure you have a pen and your car documents to fill out all the forms. We were the only vehicle leaving so progress was very swift. Having left the Chilean border post we drove a little further along the gravel track to the Argentine side and again the officials were both friendly and efficient. Our only hold up was that we were second in the queue to four attractive young ladies crossing into Chile. At the Argentine post both people and vehicles arriving and leaving are dealt with in the same hall, and clearly the young border guard was far more concerned with making them happy than worrying about us. Once we were dealt with however progress was very quick and we drove into Argentina. The road surface changed as we crossed the border with the gravel becoming a little smoother and then becoming tarmac after a few kilometres. Again some exploring further along the route provided us with a wonderful 9 kms section through the mountains, all uphill bends and fabulous views. As we headed south we had a choice to make, do we take the gravel Route 63, a shorter but much rougher route, or the 234 which promised a much better run to the finish but was slightly longer. As the event is for pre-war cars we opted for the longer, prettier and smoother route and this was definitely the correct choice. 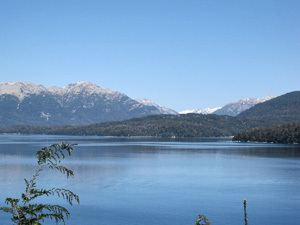 The road sweeps and swoops through some wonderful scenery and finally emerges in the lake district meaning for the last 70kms to Bariloche you always have a lake view on the right, simply stunning. The road is currently being improved and there was a stretch of nearly 30kms which is being worked on and will almost certainly be tarmac by the time the event arrives in the area. Even if it has not been finished the surface is good, with occasional bumps, but will be a lovely drive in an old car. We finally arrived at our hotel for the next two nights, just as it will be on the event, the world famous Llao Llao Hotel, a member of the Leading Hotels of the World group. This hotel is set on the side of a lake and crews will have to make the choice of either a room in the traditional part of the hotel, smaller rooms, luxuriously furnished but with no air conditioning and closer to the main public areas of the hotel or in the new wing which has bigger rooms all with a lake view and air conditioning but there is a long walk to the main areas. Tomorrow we don’t have a rest day, as the rally will, but we will use the extra day to explore every road in the Bariloche area to make sure we are using the best available. I have read that some people judge the quality of the hotel by their Muesli but not being a Muesli muncher I have always felt the breakfast omelette is a good measure and the omelettes cooked for you at the Llao Llao Hotel are wonderful. In fact the whole breakfast buffet is a great way to start your day. Leaving the hotel we used the circuit of twisty tarmac roads that surround the Llao Llao area and then headed back towards Bariloche. The town is a tourist centre and gets very busy at this time of year so we headed south east avoiding the town although this did mean using 3kms of gravel just before joining Route 40. On the event we can have two very different routes. One for those more interested in touring will use the all tarmac Route 40. This road sweeps and swoops through some lovely scenery before the landscape flattens out as you near the overnight stop in Esquel. For those looking for a little more adventure the other route option might appeal. We started with a 25kms gravel loop near El Foyel followed by a fantastic 47kms drive using the all gravel Route 6 through the hills to El Maiter. We then drove a lovely new road to re-join Route 40 for the short run south to Parque Nacional Los Alerces, stopping at a checkpoint where they wanted to disinfect any fishing equipment we had on board, you have been warned. This also gave us a chance to try and check the road conditions before we moved on. The drive through the park was wonderful, a few bumpy patches but generally good gravel and there were signs of the road being worked on and improved as we neared Esquel. Although there is an all tarmac alternative I think the scenery makes this drive worthwhile. As we left the park we joined a new tarmac road which twisted and turned as it dropped into the Esquel and our hotel for the night. Esquel is close to the half-way point in our route survey. We’ll post more soon.